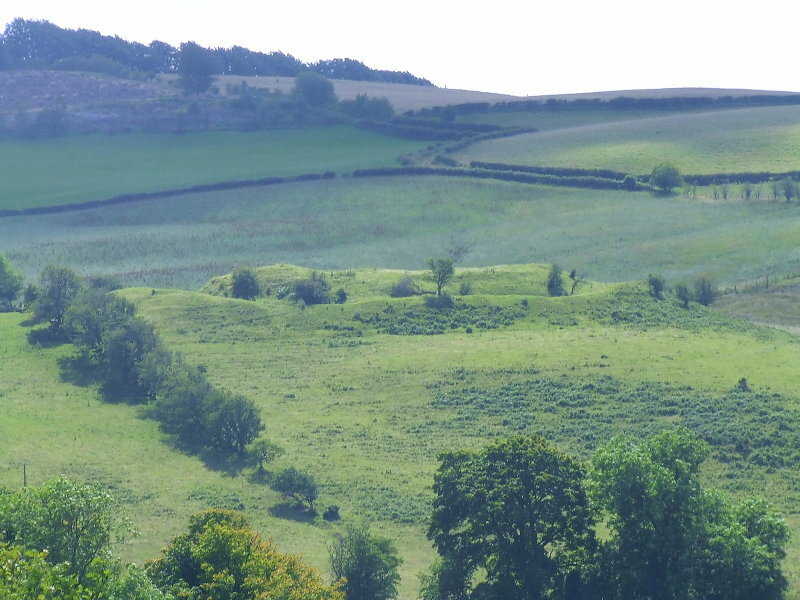 The fortifications can be seen much more clearly from this image.This was a lonely,dangerous place,in the c12th. century.Since Offa's time in the c800AD's the Dyke of his name,had marked the border.Now, with the erection of this castle,the English(Normans)Lords were pushing the Welsh princes back into their territory.Little exists now to show what a fortress this was,but excavations have shown traces of a round tower 11m. in diameter,with walls 2.4m.thick.A gatehouse was built at the LHS(of image) to a height of two or three floors.Flanking walls were strengthened by solid "towers",halfway along each side.It probably fell into disuse after 1282,when LLewellyn ap Gruffudd was killed.